As I wrote earlier, we now have a good basis for looking at the range of ways in which digital technology and other innovations can help us in later life. Nominet Trust have supported both Shirley Ayres’ paper on how online innovations may enhance social care, and our own exploration summarised here. Last week NESTA launched an expanding Living map of innovation projects, and their report Five hours a day, about which more later. So – we need knowledge-sharing and collaboration among resource-holders, ways in which people can find and use what’s available – highlighted by John Popham and in our work – and also further work to translate research and ideas into action, and scale up successful projects. Fortunately NESTA have produced a report by Halima Khan, entitled Five hours a day, that provides a framework for the way this might be done. (The five hours a day refers to the equivalent extra time added on to the end of our lives through increasing lifespans). The report sets out a systemic approach that reflects another piece of work by Geoff Mulgan and Charles Leadbeater on Systems Innovation. It about how you can’t fix problems in isolation and within one discipline, how one solution depends on another, and so about the benefits of joining up ideas and solutions. 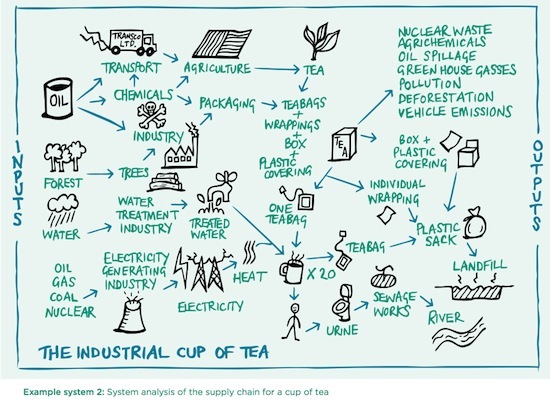 The illustration of what it takes to make an “industrial” cup of tea brings that home. to have a purpose – feeling useful and valued as an employee, volunteer, mentor, entrepreneur, employer, hobbyist or source of advice with a cup of tea. in a formal role, or informally amongst friends and family, inside or outside the labour market. to have a sense of well–being – living as well as possible with health conditions, being physically active and emotionally resilient. it’s also about happiness, choice, control, intimacy and personal relationships. to feel at home and connected to others – feeling at home wherever we’re living – in a care home, shared housing or in our own home. it’s about living where we want to live, being as independent as possible and also connected to a supportive social network. Alliances of key organisations that recognise the same challenge, rally around a shared vision, have influence across key sectors and an appetite for real change. these alliances should reflect, at their core, the insights, priorities and perspectives of current and future older people. And they should work hard to do this authentically, beyond the small numbers of the already–involved, to using creative ways to tap into the great variety of people who have a stake in this agenda. Systematic experimentation to develop, test and scale radically improved solutions. Critical to this will be generating useful and appropriate evidence, focused on demonstrating impact in real situations. it will also require a strong understanding of which methods of experimentation are most appropriate to different stages of innovation. And relevant here is the role of clusters to systemic change; what are the key relationships between complementary innovations and how can they be leveraged to increase overall impact? Policy innovation to transform the conditions for change, build on behavioural insights and apply social innovation techniques to policymaking. the aim should be to embed outcomes throughout the policy process, to create locally–relevant solutions based on sound evidence with local stakeholders, and to combine policy and delivery into an iterative process that achieves significant impact and avoids the weaknesses of the traditional policy/delivery split. Innovation infrastructure including developmental functions such as institutions with the capacity, timescales and resources to carry through genuinely systemic change – whether that be in terms of political change, or orchestrating knowledge or mobilising people to change their behaviours at scale. Local demonstrators which take a whole population approach to explore the impact of a set of interventions. this type of whole place intervention would create an opportunity to apply systems thinking to specific locations, building on existing local work and generating an evidence base for how to make change happen. We think we are part–way through systemic change on ageing and that change is needed on a number of different fronts to move forward – policy, products and services, markets and behaviours. We think there are a number of different mechanisms that could be used to contribute to systems change – including using alliances to make significant headway on systemic issues through clusters of innovations, key pieces of developmental infrastructure and testing at scale in real places. Nesta is already active in this field through our impact investment Fund, Ageing Well challenge prize, the ventures supported through the innovation in giving Fund and our practical programme on long–term conditions, People Powered Health. We also have previous relevant work including Age Unlimited focusing on older social entrepreneurs. Our next step is to discuss and test further the ideas put forward in this paper and to prioritise our own areas of action – as an investor, innovation manager, centre of research and supporter of innovators. I’ve quoted at length from the report because there does seem to be scope for joining up with the work that Shirley, our DTlater team and others are doing … and this requires better communication. I hope NESTA won’t mind me re-iterating how difficult it is to report and connect this sort of work when the main means of offering content consists of a fairly brief blog post and a lengthy pdf. It is a format that is used by other funders and agencies, and academics. Doing a cut and paste to extract material is tedious. There is relatively little coverage because the many ideas in the pdf can’t be individually referenced. The Living map is a much better format, if it could be extended to include other material. If we are to promote systemic thinking and doing I believe we need to consider how to develop the social ecologies that would make this possible. Steve Dale is developing ideas in a series of posts. We’ve tried making content accessible and re-mixable in our dtlater exploration by crowdsourcing ideas on a Google doc, using an ideas platform and social learning space, running a workshop, creating reference in Storify, then compiling a draft – as described here. The potential value of this approach is that chunks of content can be curated and used in different ways, and the process can help to build conversations and networks. I’m calling this process social reporting, as a shorthand for the mix of content creation, facilitation, workshopping and curation that’s needed. I hope we can find some ways of keeping the process going now there is so much valuable thinking, and so many projects surfacing. One immediate task could be to cross reference the Living map work with the resources the Shirley Ayres and our team have located, and then follow through with some of the steps Shirley advocates. However, I think we’ll only get a really innovative social ecosystem emerging if there’s a good content framework … and of course more investment in social reporting! The Big Lottery Fund (BIG) is in the process of establishing a Centre for ageing better. BIG has been developing plans for this ‘centre’ in conjunction with groups of older people themselves, and other stakeholders including the Economic and Social Research Council (ESRC), the Department for Communities and Local Government (DCLG), Department of Health (DH) and Department for Work and Pensions (DWP). Further details about this centre will be announced by the Big Lottery Fund at the end of March 2013. The plan is for this Centre to become a member of the What Works network, recognising that it will be delivering the ambitions of What Works in ageing better as part of its remit. We know lots about innovation, digital tech, social care and later life. Now who will make it useful? Just as I was cleaning up a final draft of our exploration into using technology later in life – now available here – the Ageing and innovation team at NESTA launched their Living map of ageing innovators as a blog with scores of projects for starters. It’s not so much that the innovators are ageing – more that they are developing ideas, apps, projects to help us meet the challenge of living longer, and doing it well, as we have explored on behalf of Nominet Trust. There’s some further good tech examples on the map that we can add to our resources. I confess I didn’t know the Living Map was in process. Nor, I think, did Shirley Ayres, author of the recent excellent Nominet Trust paper Can online innovations enhance social care? As I reported under the headline How more sharing could enhance social innovation, Shirley’s main recommendation was for a Community Wellbeing and Social Technology Innovation Hub, so I wasn’t surprised to see her tweeting “really concerned about duplication of resources” and questioning “where this project fits w/ all the other age & innovation projects underway?”. I guess there is a point about how far it might be possible to share research-in-progress. We ran an open process, and Shirley is highly visible online, but it may be more difficult in other sorts of research contracts. Anyway, I’m sure we can now connect well with the NESTA team and maybe do some integration. There’s value in different perspectives, and “Ageing innovators” isn’t just about tech. The point of this post is more about another issue that been at the back of my mind as we worked on a brief aimed at developing content useful to anyone considering investing in the area and/or developing projects and programmes. I hope that the 10 provocations summarised below (more detail in the draft) are good talking points and guidelines for anyone interested in the field. They might be one way to categorise projects and apps identified in our various researches. However, this and the other research is not designed to be directly useful to someone thinking of getting – or giving – some useful technology for later years. We discovered relatively few examples of user/consumer guides tailored to older people or those helping them. The best we found were by DigitalUnite, but they are fairly broad, because there’s a lot of ground to cover and the focus is on digital inclusion. I’m pretty sure Emma Solomon and her excellent team agree more could be done to turn lessons from latest innovations into something more specifically useful in relation to health, finance, learning, combatting isolation for example. I’ll ask. So – we now know lots about social innovation, ageing, and the possible useful role of technology later in life. There are lots of good projects, with more to come as funders focus on this field. But the real challenge now is how individuals – not just projects – can use the hugely powerful tech available in smartphones, tablets as well as computers and other devices, and how they can be supported by friends, family and other helper, not just in courses. We highlight the issues in the provocations below. Who is standing on the side of older people (and the not so old) in making all this innovation useful? 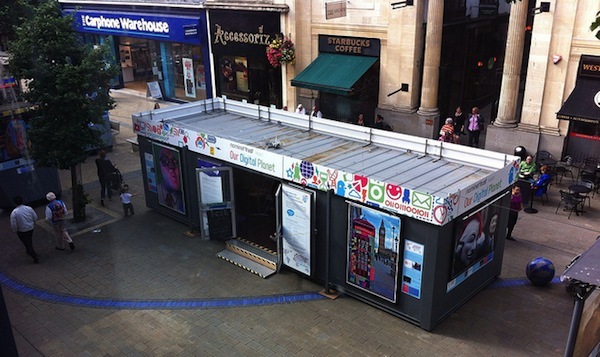 John Popham, a member of our team, has been running the Our Digital Plannet exhibitions (above) in town centres with Nick Booth and Lloyd Davies – and is now planning phase 2. It may be that others working in the field are pitching at Nominet Trust, NESTA, Big Lottery Fund and others for resources to do just that. I particularly like John’s approach of getting into the High Street, and also leaving something behind. I hope our report helps support their case … but I also hope that the funders find ways to share thinking and make sure we get the best out the work done so far. Maybe we could all have a sort join un-launch of work so far, to help start the conversations. That’s (constructive) provocation number 11. Do share your thoughts here, or join us in the Social Learning Network. Provocations in the draft report. 1 Look at personal needs and interests as well as common motivations – one digital size won’t fit all. While there are general benefits at any time of life in using digital technology – whether for entertainment, shopping, learning, information – everyone has different priorities and these will be shaped by life experience and current circumstances. The best way to engage people is to start where they are, the particular interests they have developed, and the personal challenges they face. 2 Build on past experience with familiar technology as well as offering new devices – they may do the job. New devices can be challenging, and recent developments of familiar equipment may offer an easier route for some. Smart TVs and smartphones may provide what’s needed without learning to use a computer. 3 Consider the new life skills and access people will need as technology changes our world – using technology is ceasing to be optional. Public services are becoming digital by default, and new opportunities for employment require at least an email address. It will be important to make the use of digital technology as accessible and easy as possible – or encourage people to act as “proxies” in helping make the connection with the online world. 4 Turn the challenge of learning about technology into a new social opportunity – and make it fun. Learning how to use digital technology can challenging. It takes time, and having someone to help can be important. Loneliness and isolation are a big challenge for some later in life. By getting together so learning becomes a social experience we can achieve benefits on both fronts, and enjoy the experience as well. 5 See digital technology for later in life as a major market – co-designing with users could offer wider relevance. On the one hand people are living and remaining active longer, and on the other hand facing a wide range of health and social challenges for longer. This will provide a growing market among older people, and an opportunity to design and test technologies for relevance and usability with any users than have diverse interests and capabilities. 6 Address social isolation and other challenges through a blend of online and offline – they don’t need to be different worlds. Digital technology can enable virtual friendships that lead to meetings, support social learning, and underpin projects for new forms of sharing both on the physical world and online. The greatest benefits may come from blending face-to-face and online activities. 7 Enable carers and care services – both for direct use of technology and to act as proxies. More could be achieved by integrating digital technology into services, and supporting carers in their use of technology. This will be increasingly important as older people who are not connected may require “proxy” helpers to use online public services. 8 Use digital technologies to enhance existing connections of family and friends – and help each other learn. Free video calls, photo-sharing, email, texting and the use of social networking sites are part of day-to-day communications with family and friends for many people later in life. Family members can help each other learn about digital technologies. 9 Value the role that older people may have in acting as digital technology champions – and providing long term support. Older people know the challenges of using technology later in life, and may be best at providing the continuing support needed for its adoption. Demonstrations and short courses are seldom enough. 10 Look for ideas among those providing digital training and support – and help them realise them. Those working directly with users of digital technology will have insights into what works, and where development would be valuable. With some support they could turn ideas into projects.